These high quality Black Velobind compatible binding strips are specifically designed for use with your GBC Velobind Hot Knife Binding system. Show your best with this professional, book like finish. Documents bound with a Velobind Hot Knife Binding System are great for filing, stacking and mailing. With GBC's patented Hot Knife binding technology, these black spines permanently lock pages into place to keep reports and proposals secure. These Black Velobind compatible Binding Strips are designed for use with GBC's line of Hot Knife Velobind Systems including the GBC V800pro, GBC Velobind System Two, GBC Velobind System Three Pro and GBC Velobind System Four "Bind". Size: 1" x 8.5" - 3" x 14"
Great product! Very helpful sales person! 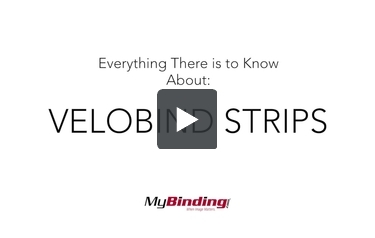 Velobind Hot Binding Strips Review by Pat Y. These strips are durable and easy to work with. They're easily removed to unbind documents and hold securely and with archival quality for years. Buyer Review by Kurt K.
Excellent product, always great service from MyBinding!! Office Manager Review by Denise S.
My on-line shopping experience with My Binding is always an exceptional experience. Their web-site and product search is user friendly and easy to use. I have been purchasing binding strips from them for years and I am 100% satisfied with the product I purchase from them. Thank you for your question. The 3 "x 8.5" Black Velobind Compatible Hot Knife Binding Strips have a shipping weight of just over 4 lbs per box. These strips look very similar to the GBC brand Velobind strips but are significantly less expensive. How does their quality compare with the GBC brand? These items work the same and will provide the same awesome bind that you get with genuine GBC Velobind strips (we sell both). The only real difference is that these don't have the Velobind logo. If you aren't 100% satisfied with these we will gladly accept them back and get you the GBC ones. However, we haven't had a customer take us up on that offer yet. Do I need a machine to use this or can I just order pre-punched paper? These strips require a hot knife system to cut off and permanently weld the document together. Without the machine you would be unable to finish the binding process. However, you can achieve a similar look with pre-punched paper and 4-pin reclosable Velobind binding strips if you don't have a machine.